Rowing ergometer is used very frequently to evaluate the performance of rowers and to predict on-water rowing times. Mikulic et al. (2009) conducted a study on 562 rowers of both sexes and body-mass categories to compare their performance on rowing ergometer with their ranking at the 2007 World Rowing Championships. Of the 562 rowers, 69% were male and 31% were female; 65% competed in open-category events and 35% in lightweight. A questionnaire was used to obtain the personal information and 2000 m rowing ergometer performance times of each athlete. Gathered data were compared with the rankings at the above-mentioned championships. The main findings of the study were that of the 23 events at the World Rowing Championships, 17 correlated positively (P ≤ 0.049) with the rowing ergometer times and 12 events had a correlation coefficient greater than r = 50. The highest correlations were observed for lightweight men’s single sculls (r = 0.78; P = 0.005), women’s single sculls (r = 0.75; P = 0.002), men’s single sculls (r = 0.72; P = 0.004), lightweight men’s double sculls (r = 0.72; P = 0.001) and lightweight women’s double sculls (r = 0.69; P = 0.001). 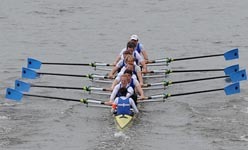 No correlations were found in four and negative correlations were observed in two events (men’s coxed pair and lightweight men’s coxless pair). Negative correlations could be the result of the small sample of rowers in these groups. The correlations were stronger for smaller boats (single sculls, double sculls and pairs) – this was probably because rowing ergometer simulates on-water racing conditions better for smaller boats than for larger boats as the performance is dependant of only one rower. In larger boats, rowers have to coordinate and synchronize their movements which cannot be assessed on a rowing ergometer and could lead to discrepant. In 12 of the 23 events the correlation coefficients between the 2000 m ergometer time and 2000 m World Rowing Championships rankings were positive and greater than r = 50. This indicates a moderate-to-strong relationship between the two types of rowing. Stronger correlations were observed for smaller boats. Although the rowing ergometer and on-water rowing are not exactly the same disciplines, from the physiological and biomechanical aspect they are similar. Therefore, these data must be handled with caution as the standard error in the study could be too large to accurately predict rowing performance on water. Mikulic P, Smoljanovic T, Bojanic I, Hannafin JA, Matkovic BR. Relationship between 2000-m rowing ergometer performance times and World Rowing Championships rankings in elite-standard rowers. Journal of Sports Sciences 2009; 29 (9): 907-913.